Tiger Jack is Tex Willer’s faithful Navajo companion, so there are no villains in the line at all. The Mego Tiger Jack Figure like all in the Tex Willer line, cleverly reuses existing Mego parts from the American West line, but it’s done in a way that it doesn’t interfere with an accurate depiction of the character. The MTiger Jack head was also used for the American West Cochise as were his weapons and, shoes and feather (although Tiger Jacks feather is beautifully painted). Tiger Jack’s top is based on Davey Crocket but the frilled pants are somewhat unique. The Mego Tiger Jack packaging shows him carrying a rifle, unlike Kit Willer, Tiger Jack came with a rifle. 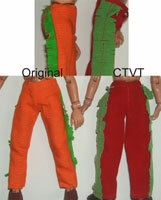 Tiger Jack wears orange pants with green fringe trim. 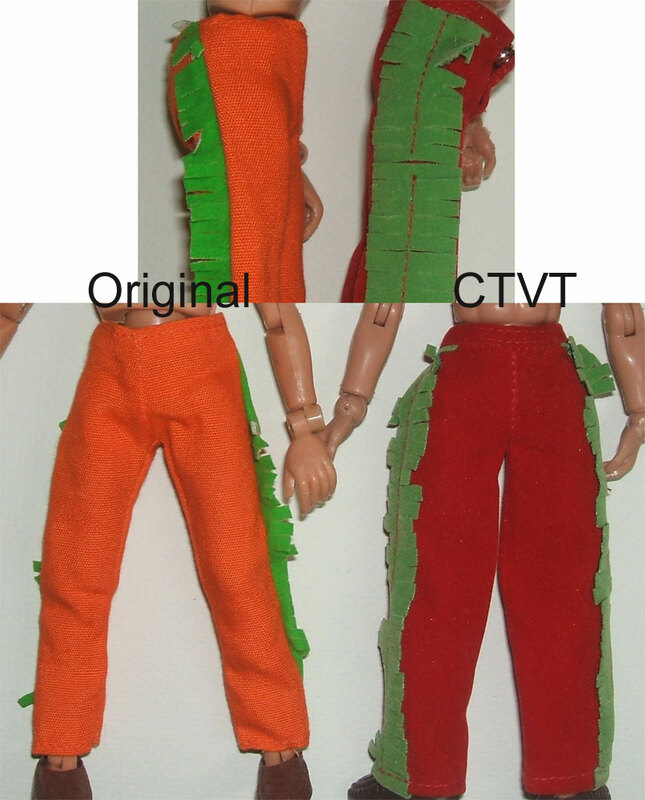 The pants have been reproduced by Classic TV Toys. 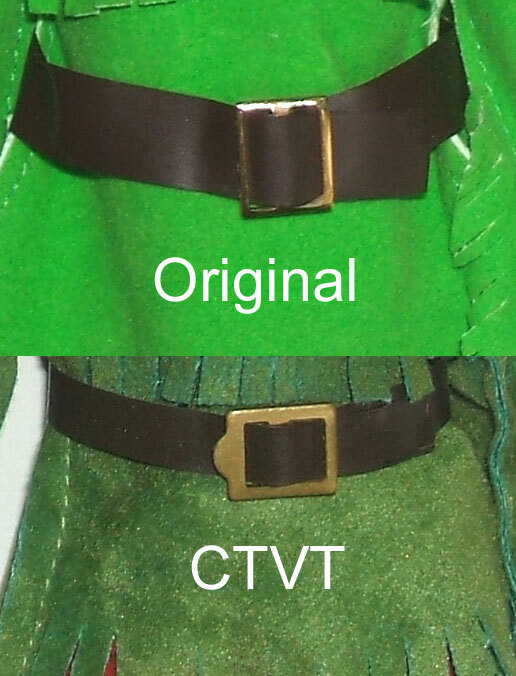 The CTVT version is red and not orange. The trim on the repro has fringe pointing both towards the front and the back, where the original only has fringe pointing towards the back. 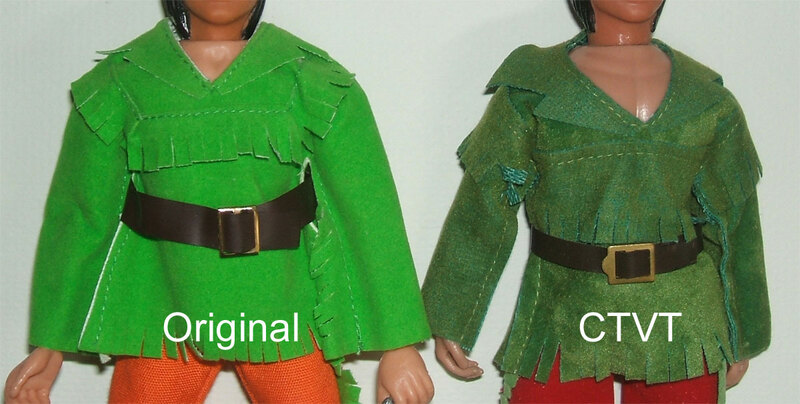 The fringe on the original is also a brighter green. The repro pants are longer, fit loosely and are unmarked. 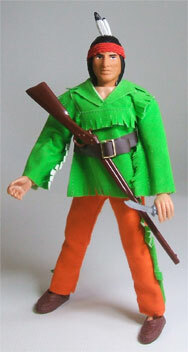 Tiger Jack wears a green version of the Kit Carson shirt but with fringe on the sleeves. The shirt has also been reproduced by CTVT. The material the repro shirt is made of is similar to the original although not as bright an green in color. The fringe on the reproduction is longger than the original where it is present, but is totally missing on the sleeves. The repro is unmarked. .Tiger Jack shares a headband with Cochise from the Western line, which makes sense since he shares a head, shoes and weapons as well. The headband has been reproduced by CTVT. The repro doesn’t have the designed edge the original has. It is straight on each edge. It is also a more maroon than the original which is red. The repro is unmarked. Tiger Jack’s feather is the same mold as Cochise, but with a unique color and paint job. TJ’s feather is white with black tips. 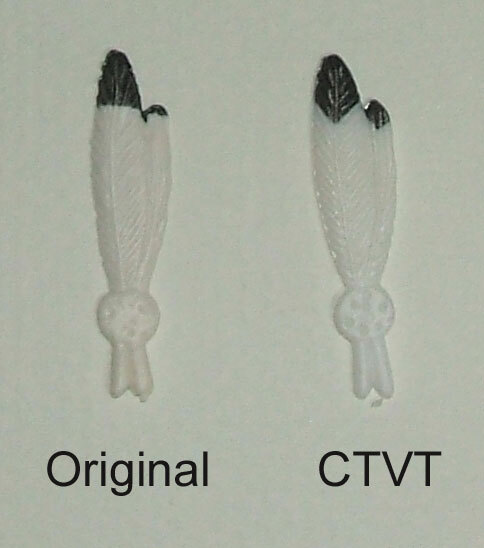 The feather has been reproduced by CTVT. The reproduction is a touch bigger with the black highlights coming to a point, where the original’s does not. It is marked CTV on the back. 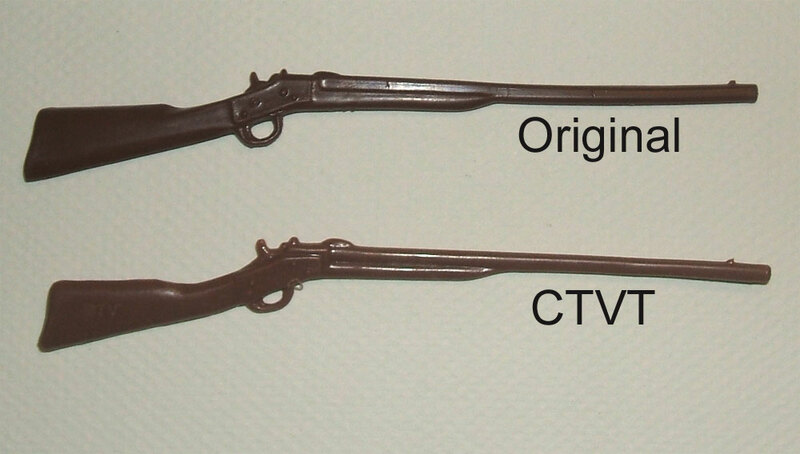 The rifle Tiger Jack carries is common to many figures in the Western line and has been factory reproduced by CTVT. The original is brown with reddish tints where the repro is a pretty pure brown and is lighter in overall color. 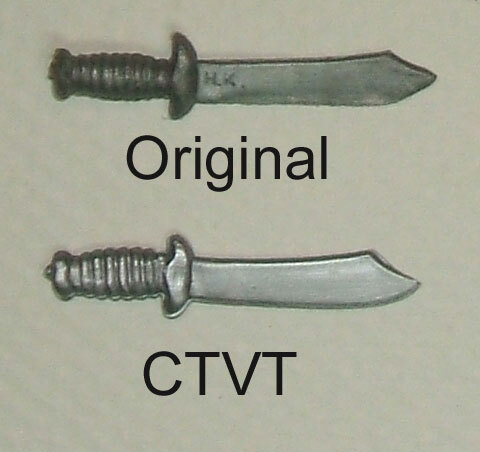 The repro is marked CTV on the stock. Also made during the Mego era by Tim Mee toys for their version of the western figures, the vintage Tim Mee reproduction is exact in almost every way. So exact that a photo doesn’t show the slight difference, which is why it is not pictured. The Tim Mee is just a slightly lighter shade of brown and just a touch more on the reddish side, although not near as much as the CTVT reproduction. Tiger Jack wears a wide brown vinyl belt with a gold buckle. This belt has been reproduced by CTVT, but is more narrow, with a buckle that has a rounded shape on one side. The repro is a lighter brown and is unmarked. Tiger Jack shares a blade with many figures in the Western line. It has been reproduced by CTVT. The reproduction is a little shorter and wider. The original is marked H.K. (Hong Kong) on the blade, and the repro is unmarked. Tiger Jack wears the same moccasins as some characters in the Western line, some characters in the Planet of the Apes line and Starsky from the Starsky and Hutch line. They come in various shades of brown and burgundy tones. They have been factory reproduced by Classic TV Toys, EMCE Toys and Tim Mee. 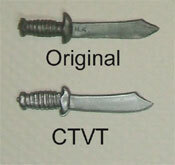 The CTVT reproductions are a darker brown than originals and are a little shorter with a slightly different overall shape. They are marked CTV on the inside. The EMCE reproductions fall well into the range of color shades you find originals in and the material used to make them is spot on, however, they are taller than originals. You can also notice that the original mocs were poured from the side (the minor flashing is evident) but the new EMCE versions are poured from the back. The other thing that makes the EMCE version spotable is there is a stamp on the inside of each moc. On the one I examined, one moc had the number 1 stamped in it, the other had a 4. To make matters a little more confusing, Tim Mee reproduced the Mego western line back during the Mego era using the same molds. So there are vintage mocs out there that are identical to mego in almost all respects. Color, material, molds, etc… The Tim Mee mocs are just a touch thinner, making them a little more flexible than originals. The big difference is that the Tim Mee’s are marked made in Hong Kong on the bottom, while the original Mego’s are unmarked. Tiger Jack shares a headsculpt with Cochise from the Western series. It has been reproduced by CTVT. The reproduction is a much softer vinyl and has a longer neck, but a shorter overall face. The paintjob on the repro is less severe. The eyebrows and eyes appear less angry. The repro head is unmarked. 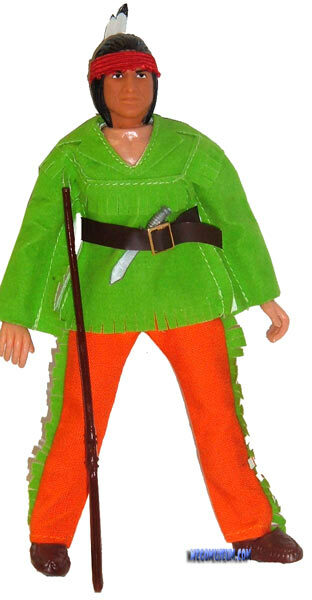 Also reproduced by Tim Mee Toys during the Mego era for their Cochise figure, The Tim Mee head is very similar to the original, although just a touch wider in the cheeks. The eyes on the Tim Mee have white dots the original Mego does not have. Tim Mee used a flesh color more on the red side for the Native Americans in the Western line so the Tim Mee head has a more red flesh tone.